Why wonder about 10 things I wish I knew 10 years ago? January was my rheumaversary. Yes that’s a new word. But it’s pretty clear what it means. 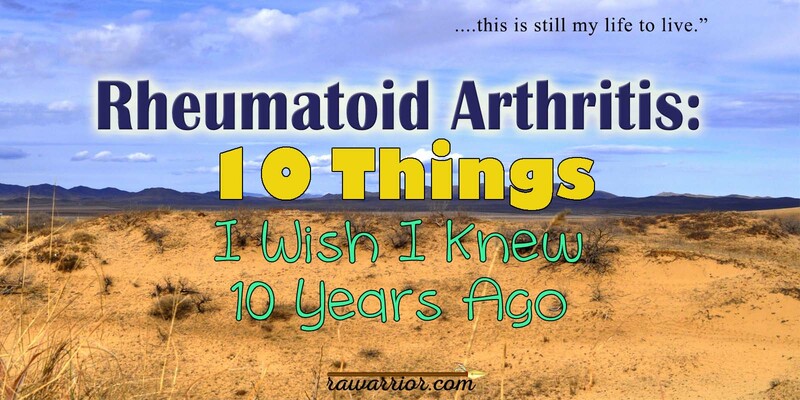 Over the past few months I’ve been pondering what it means to live a decade with unrelenting rheumatoid disease. What does my future hold? There is so much I wish I knew 10 years ago. Maybe I can help my future self by thinking through what I’ve learned so far. And maybe I can help another patient. 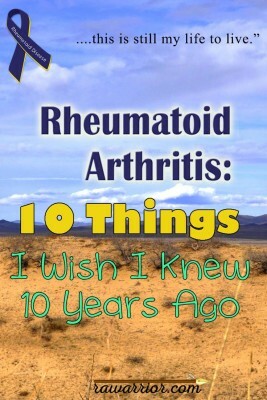 I’ll try to boil this down to 10 things I wish I knew 10 years ago about Rheumatoid Arthritis (RA) / Rheumatoid Disease (RD). But I’m sure your comments will be a great help to readers too. 1. I am not alone. I wish I’d known that so many people have RD. And how much it helps to be in touch with a community like RAW. When I began to realize it, I dreamt of RA Warrior, started working hard, and never looked back. We don’t need to all be alike or to all agree. We just need to know we are not alone. 2. I might not relate to you. Other people with rheumatoid disease (PRD) might not share my experience. This goes for the disease and the meds. Some have 1 joint affected; others have 100. Some PRD have 24/7 symptoms; others have periodic flares and feel more normal in between. Some improve greatly with meds; others might as well inject water. 3. I need to take care of me. I learn this one over and over. It’s so hard when you love to take care of others. And even harder when disability enters the picture. But you need to do whatever it takes to take care of yourself – so that you’re able to do the other things you care about. 4. Every day is not the same. This is good and bad. But I sure wish I’d known that the course of the disease changes a lot over time. Your RD today might not be the same as your RD in 5 years. For me that means it changes what part of me is most severely inflamed or whether it’s swollen or red or stiff. For some I know now that can mean remission, so I always hope for that. 5. I don’t have to stay on treatments that don’t work for me. I wish I would have known how long to try a treatment to see if it works. I did 6 months on some meds, and 2.5 years on another. If there are unpleasant side effects like I had, 3 months seems like plenty of time. I’d look at the clinical trial data and see how soon people tend to respond. 6. Doctors don’t know everything. I wish I knew that doctors often don’t read research and are not aware of cutting-edge research on rheumatoid disease. Much of this information is available online if we make an effort to look for it or participate in a large patient community like RAW. 7. I’d never be the same. I wish I had known on the day I was diagnosed, how much rheumatoid disease would change my life. In the end it’s up to me how much of my life I get back – even if I have to fight to get it. My pursuit of happyiness is my responsibility. But RD changes things. 8. It’s okay if people don’t get it. I wish I knew up front that most people will not understand or believe what it’s like to live with RD. They have nothing to compare it to and they tend to assume you are exaggerating. Knowing this is typical would’ve helped me feel less hurt when it happened over and over. I wrote about this in my first month blogging, and others were helped to know it’s just a normal experience with RD. 9. We do not understand this disease yet. There is ongoing research on a myriad of topics related to rheumatoid disease and other immune mediated diseases. If someone tells you definite facts on how rheumatoid arthritis starts or is cured, they are probably wrong – at least in part. 10. No one can tell me my future. I wish I’d known that there’s no typical RA. People will tell you “It will get better,” or “It will get worse,” or “Meds will help just be patient.” But their experiences are no predictor of yours or mine. 11. Trust myself. I wish I’d realized that it’s okay to speak up when doctors or others say things that don’t seem right. My experience is my experience and that is valid even when it’s different from another’s. I’m not crazy or exaggerating – this disease is a crazy exaggerated disease. Well there are 10 things I wish I knew 10 years ago. I feel like there could be many more on the list. I hope this helps someone else think outside the box. One thing I’ve learned in 10 years with this unwelcome companion of RD is this is still my life to live. What’s on your list of 10 things I wish I knew 10 years ago? 1) TOMORROW February 2 is the 4th annual Rheumatoid Awareness Day. For more info, read my post – click here. If you have any kind of blog please participate in RPF’s Blog Challenge & email me the link to your post Kelly @ rawarrior.com. I’ll host a blog carnival here on RAW during the next week and share about your blog. 2) Last week I sent out my personal email letter called The Spear. That’s different from receiving this blog hot off the press as a favor from Google (the “Feed.”) If you didn’t get my letter, it means you aren’t signed up. You can sign up for the letter here. Boy number four really resonates with me. I have had RA (clinically diagnosed that is) for 6 years. When my RD first started it was bad but didn’t always effect my whole body. I was naive in thinking this would always be the same and the meds I first tried seemed to help for about a year then stop. Hey again thought this would still be about the same. Now 6 years in my whole body is in constant pain there are no pain free days , and I can’t walk with out a severe limp. I have a or who is 101 years old and she makes laps around me. I have gone through 6 biologics nothing is working. My pain most days is a 10 and I count myself lucky as the days my pain is 20 it is so horrid. I finally quit thinking okay this is as bad as it is can get because my body just chimes in NOPE I can get much worse. I have had RA for almost 30 years now. I have been on everything and sometimes twice. You really have to realize you have really no control over this disease but there are things that make you feel better. From the beginning there were so many different things that were easy to live with and now I am in the the later which is hard to. I have had so many operations that I forget some, it’s kinda like the old woman in the shoe with operations! I have had 2 knees replaced as well as 2 hips which has helped me in the pain department no pain there anymore. The knees were horrible! I have a sense of humor that has pulled me through these years. All of these 10 I can relate to. For so long it was people just don’t understand your whole condition. They think it’s a bad knee and that’s it. My mother in law shows me one end joint on her little finger on her 93 year old hand and tells me it hurts! Unbelievable. I have acquired other diseases from my R A along the way. I was close to death a year or so back with virus and turned Septic in coma , in ICU, had a heart attack , but made it and started breathing on my own. All complications of good old RA. You are not alone, there are many of us. Loved reading that blog post. I just had my rheumaversary in december. Can`t believe i`m dealing with it already 10 years. I’m a newbie and I can relate to every single one of these. That’s a plus for me because I know kind of what to expect. Except #7…I am the same…..until I’m not. The day I can’t get on my horse is the day #7 is true. I dread that day. Ten years ago I wish I had known that perforated divirticuli(ae) were a potential side-effect of many of the drugs AND a real risk to my life. In September in emergency surgery, I lost 50cm. of my large intestine, then spent 4 months with an ileostomy. I have had reversal, but if it happens again, I will lose my entire large intestine. All I can think to say is that I am so sorry for all of us, and this is my life. I haven’t been able to get on my horse for 2 years (that was my gauge, also, as to when this disease had gone too far). I was diagnosed 5 years ago, but my rheumy is convinced I have had it since at least high school. Sure has made a lot of things make sense. I have lost my life as I knew it so each day that God chooses to give me I try to spend creating a new me. This disease has robbed me of so much, including my previous daddy. It has now chosen my daughter and her 7 year old son. That is the one that brings me to my knees most often. I live in constant pain, horrible bruising from side effects of meds, never knowing if today will be a “be able to get out of bed” day or not. I pray for each of us. God, please have mercy and please bring remission. As always, thank you for your posting. One of the most helpful bits of info I’ve ever received was to use a plastic utensil after taking MX. The taste of the metal spoon or fork in my mouth literally gagged me. A plastic spoon for a couple of days each week was a godsend! So simple, so appreciated. I am over 12 years with RD. Did okay for a while. I have been on and off lots of different medications in the last two years. Reason- some medications stopped working and I went through a whole different medicine regiment. These prescriptions were terrible on my stomach, which was already weak. I got really sick. Finally, I stopped working (maybe a withdrawal issue, but docs. weren’t sure). Diagnosis- Microscopic Colitis. I lost 30 pounds. I’m back on Humira and Lomotil, but nothing else. Several months ago I thought I was going to die from all this. However, managing diet, stress, rest, sleep, and taking the least amount of medicine has helped…for the moment. I drink tea, take vitamins, eat extremely healthy–and I am not giving anyone excuses about why I can’t be somewhere any longer. I have heard it all from friends who just don’t have a clue–even when I try to explain it to them. Everything about this disease is unpredictable. In my case recently, Glenn Fry has been my topic of discussion. I hope and pray that does not happen any of us. Keep fighting everyone!!!!!! Passing my 10 year mark was weird. Something about it made me go, “oh yeah, this is forever.” Diagnosed at 17, I don’t remember what it felt like to live without it. I am glad I found your blog. Newly dx but have been suffering for years it AWESOME you do what you do. Thank you!!!!! Your post touched my heart.Other things are going on that I won’t mention as we all carry our own cross. I wonder how you are today. My RD has decided to almost totally wipe out my voice with calcifications aka RA nodules it will never recover, and it’s been a real wake up call, among other usual symptoms that have reared it’s ugly head. My bp has sky rocketed to readings of 210/110 and for the 1st time a heart med has been added to a max out amount of bp meds. I’ve not had high bp before , and it doesn’t run in my family. My Dr’s are ready to scanning other organs now as it’s taken it’s toll on my body and the severe damage is taking hold as I’m in flare and have been for awhile, but worse than I ever realized. I pray for you my dear and hope to hear how you are today. May God bless you and thank you Kell for this beautiful website and letting us know we are not alone. I’m suffering from RA since the last 8 months or so. I guess that makes me the freshmen here. Fortunately for me, iv been feeling great since my medication started about 6 months back . It might be just a temporary thing but for now, I’m over the moon. There’s a little tinge of pain always there, but it’s way better than when I was diagnosed. Being a former sportsman , I feel a bit embarrassed now but luckily my buddies and parents have been great even if they don’t quite understand the severity of my condition. One thing iv got to add- it’s my personal belief that going vegan really helped me get over the pain in the joints. It was my doctors advice and it worked . I can feel the difference . Thank you for your post of “the 10 things I wish I knew 10 years ago.” I cry reading it. This is my first year, diagnosed in February, and I appreciate learning all I can about RD. I can tell that for me I need a community of support to live well and healthy with this disease. I have started a daily journal to keep track of the ride. I’m coming up on 8 years diagnosed. I’ve hit my breaking point with rheumy’s that don’t listen and meds that provide minimum relief. I recently started seeing a functional doctor and what a difference. He doesn’t look at me like I’m crazy when I mention hormones or stress being triggers. If you’re able try one out. He is testing my adrenal glands among other things. Never heard of adrenal fatigue before but it’s one of the leading contributors to inflammatory autoimmune issues. My jaw dropped when I went through the symptom checker. Diet matters. Biggest truth ever. Your body is made to heal itself but only if it has premium fuel to run on. Maybe I’m jaded, not trying to stand on a soapbox, but you are your only advocate. Research and don’t settle for what your rheumy says. This can be reversed by learning what triggered the disease to start. I have had Rd for about 15 years now, or should I say have been diagnosed about that long. I am sure it was hanging around long before that. Something very weird has happened in the last 3 months. I had surgery for bowel cancer. Which, went well. Then I seemed to be pain free. So I stopped all meds, but plaquenil and am still pain free. I do not have any symptoms other than 1 and that is if I walk to far my hips will bother me badly. I wish I knew what was going on and when I asked my rhuemy she just said that maybe I never had RD. Please, has this happened to anyone else and I have to mention that I just moved and have new Rheumy. Is this going to last or is it temporary, and also , I have to say that my other half, not married, always tells me to go to bed. Even if I am okay. He says that it will get worse. So I am in bed alot and sleep alot. Thanks for listening and would love to hear. Donna, it sounds like a remission was triggered by the surgery, the same way many had the disease onset triggered by an event. No, I don’t think you need to rest all the time. But I do agree that something might trigger it to return eventually. But you can’t live waiting for that – you just need to live your life. If it were me, I might avoid extreme activities and take good care of myself just in case that helps. It does sound like your S.O. just cares a lot for you. As far as meds, that’s up to you and the doc – I’d probably do what you did, just maintain on the one dmard. I think I would add to that list to treat early and aggressively to prevent permanent joint damage. My rheumatologist wanted to start biological early on, but I resisted for a long time because of the side effects and immune suppression. I waited until I was miserable & couldn’t take it anymore b/c the DMARDS just weren’t keeping it in check. As a result, I’m sure I have joint damage that could have been avoided, and I’m miserable with pain pretty much all the time. That’s a tough lesson to learn, with serious consequences. Don’t let fear of side effects scare you…the consequences of untreated RD can be far worse (and permanent) than any drug side effects, which usually go away once the drug is stopped. I’m a nurse, & should have known better. But I wasn’t as familiar with RD (like many health professionals), & we tend to be the worst patients & try to tough it out. Don’t think you can tough it out. START TREATMENT EARLY AND AGGESSIVELY! I felt like you’re talking about me.. I’m happy that I’m not alone.. I have rheumatoid arthritis but as long as I avoid nightshades I don’t have any pain. My naturopath told me to try it, cut out all nighshades, she said it would take about 3 weeks to notice a difference but the difference for me was noticeable in 1 week. This was hard for me as I grow most of my own food and I had tomatoes, potatoes, capsicum, eggplant and chillies growing in my garden. Not anymore. I can eat them occasionally, usually at a friends house or out for dinner but only 1 meal and never 2 days in a row. Worth trying I would say. Everything we put in our mouths effects our health. I was finally relieved of lifetime migraines at age 50 last yr. l got the Daith ear piercing and within a few hrs l was healed. No diet change,just the inner ear cartilage piercing for $68 and success rate for those with severe migraines is above 87% success rate. If l can help anyone with this it would bring me great joy to help someone else. It has made the RA bearable. On Simponi and lyrica and doing better at 51 now than all the 23 yrs with RA. I pray this helps spread the hope. Wow n thanks so much for posting this site. There are many types of Arthritis. Personally I have Rhumitoid. My Mother has Osteoarthritis. My son was just diagnosed with Osteoarthritis. They are very different in the symptoms from mine but no less in pain. We all hurt. The pain is the most difficult to explain to people. I tell people that if they have ever stuck their hand into a bucket of freezing water , that aching sensation that goes from their finger tips up their arm is how my whole body feels constantly. I will also have severe joint pain along with that. I may be ok enough to walk n function on a somewhat normal basis today. Tomorrow I may not be able to move well enough to get out of bed. We all have learned ways to adapt to our individual desease. Diet n exercise help for mine. I have found nightshade foods very aggravating to my desease. I’m the DMARD Humeria. It has help me tremendously. I have been lots of different meds since being diagnosed 20 yrs ago. I have seen many Doctors. My advise to anyone is find what works for you personally. Find a Dr that listens to you n works with you. We are all different. We are not alone. This site proves that. Thank you so much. I’m newly diagnosed but knew I had some type of arthritis 4 years ago. My pcp…who I fired did nothing for me. I kept telling her my fingers and hands hurt. My middle finger on my left hand was turning. She just shrugged her shoulders and said its just age. She suggested or did nothing. Then I moved over to my current doctor who I just adore, started doing tests. I’m a little strange and not text book and my tests kept coming back as osteoarthritis. My Dr. Said it can be hard to dx sometimes. So…fast foward 4 years later and 7 of my fingers are deformed and need joint replacement , its in my hands shoulders elbows spine knees and feet. Not a pain free days goes by. I’m now on disability because I can’t sit too long I can’t stand too long and I have to rest when I need to. Now enters the meds. I’m on celebrex, methotrexate and folic acid. Doc is now trying to get me on Orencia injectable but insurance has denied it. So now were fighting to get it to go through,but its still very expensive, its a grand a shot, I know he will help me figure this out because were working as a team. I’m only 53 when my hands look 73. There are days my hubby has to lift me out of bed. Some days I need a cane others I don’t. Everyday is a different story. On top of RA I also have fibromyalgia. Take a total of 17 different meds and supplements. I’m so depressed that my normal life has been ripped apart and I can’t do the things I want or need to do. I just wanna keep up with my grandson and I can’t. He knows he can out run me….heck he can out walk me,but he’s a good boy and tries to help me with what he can. I just want an affordable med that will help. And I have to agree with the blog…not all doctors know it all. My first doctor just blew me off and now because she never checked it out or listened to me I’m going crippled. I tried to do something about it but she never …not once documented that I asked her about my hands so my word against hers. I learned a real lesson here. Always make sure your doctor documents your complaints. I missed out on 3 years of treatment. Well thanks for listening and ill be praying for all of us. Yes, I have RA since 2015. I did an experiment on my own body not wanting to suffer throughout the rest of my life. I have overcome it, it is very tough initially, you need 4 in 1 kind of controls to get through it and persist throughout ! I live in Singapore ! I am a Chinese Singaporean !